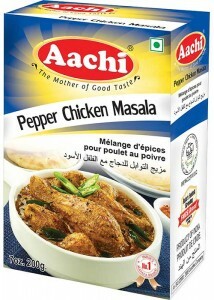 Pepper, Coriander, Cumin, Chilli, Dry Ginger, Garlic, Cassia, Cardamom, Cloves, Turmeric, Fennel, Salt. Boil 6 eggs and remove the shells. Heat oil to fry onions until golden brown. Add ginger garlic paste and saute for 3 minutes. 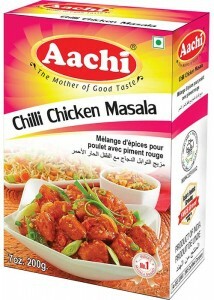 Add tomatoes, green chillies and cook for 4 minutes. 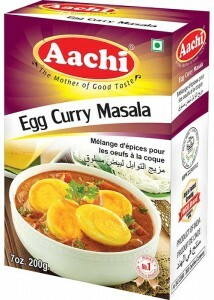 Now add 20g Aachi Egg Curry Masala and cook till the oil begins to separate from the masala. Add 125ml of water, salt and allow it to boil in a medium flame. Add coconut paste until it reaches thick consistency. Finally add the slit boiled eggs. 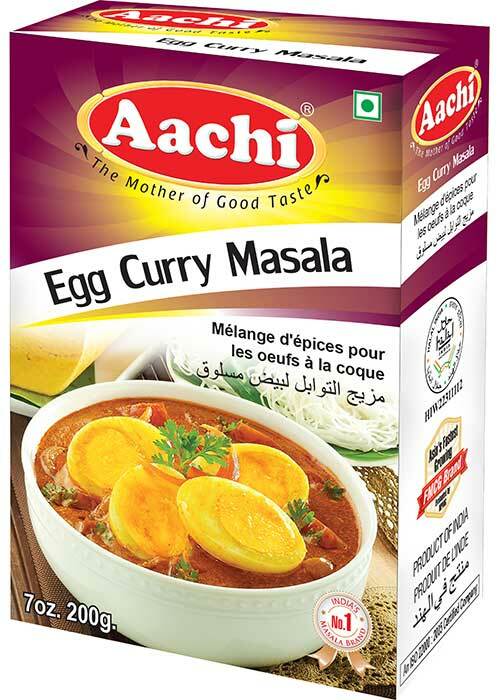 Now tasty Aachi Egg Curry is ready to serve hot. 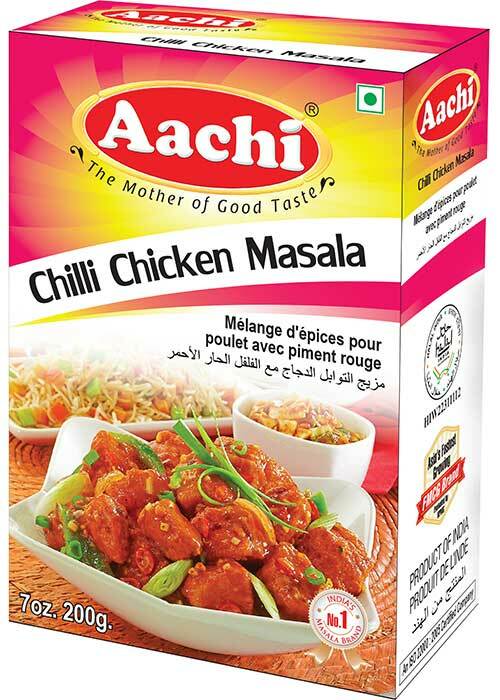 Chilli, Coriander, Cumin, Turmeric, Star anise, Cloves & Salt. 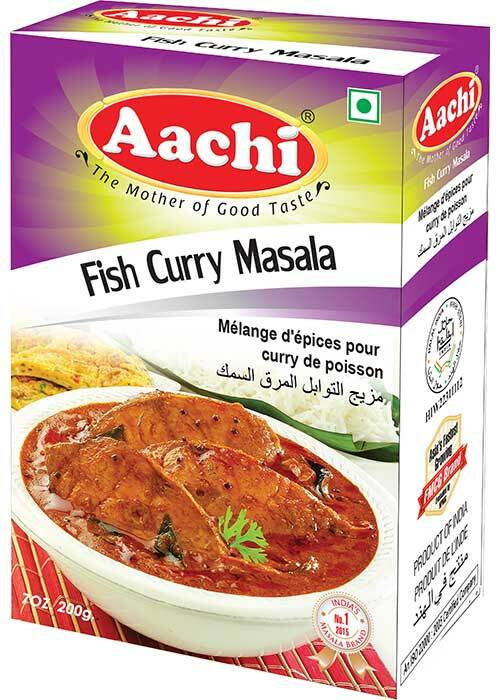 Make a paste of Aachi Fish Fry Masala with required quantity of water and few drops of lemon juice. Apply the paste on fish slices and keep it aside for 20mins. 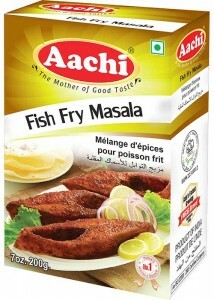 Deep fry the fish pieces in cooking oil with medium flame. No need to add salt. 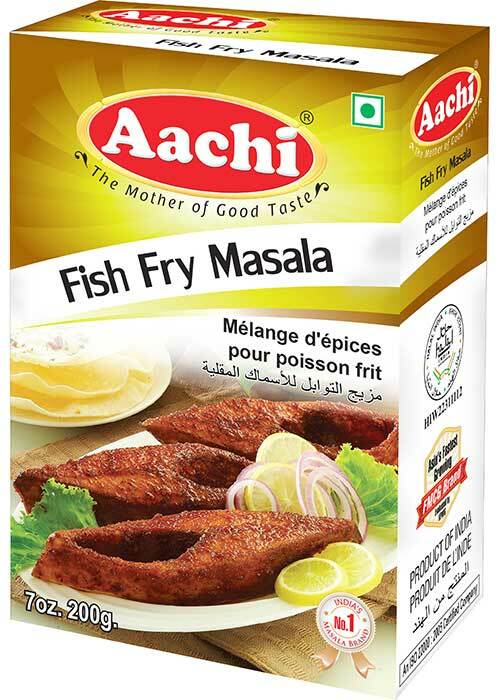 Now tasty Aachi Fish Fry is ready to serve hot. 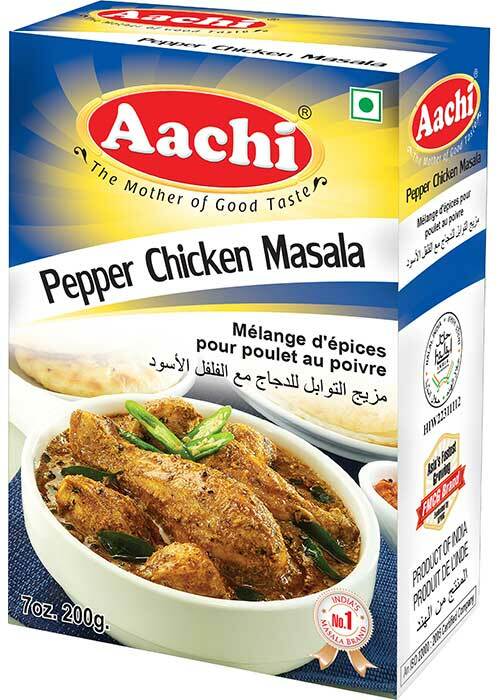 This masala may also be used to prepare yam. 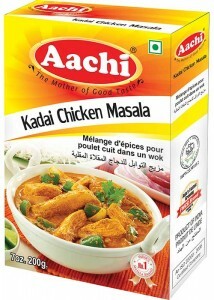 Take 50g of Aachi Kadai Chicken Masala for 1kg of chicken pieces. 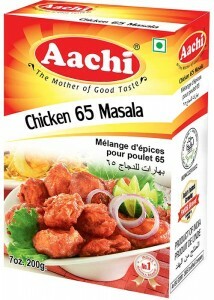 Add finely chopped fried onions, tomatoes, dry chillies (10 NOS). Boil the admixture until 5 whistles and keep aside. For best results add curry leaves fried in coconut oil and garnish. 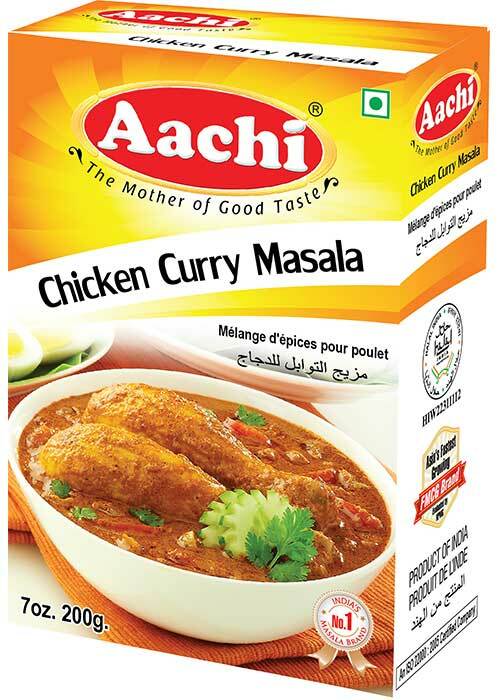 Now tasty Aachi Kadai Chicken Masala is ready to serve hot. 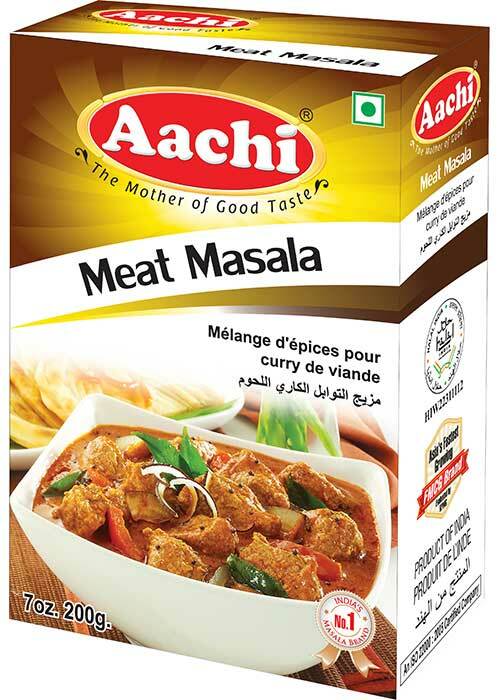 To cook 500g of meat: Take admixture of fine onion paste (made from 2 NOS), 1tbsp ginger garlic paste, salt to taste and 4tbsp of strained curd to marinate the meat for 2hrs. Fry 2 sliced onions in 4tbsp oil till golden brown. 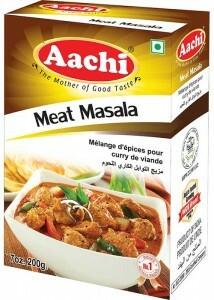 Add marinated meat and 3tbsp of Aachi meat masala and fry for 5 mins. Add 2 cups of water and pressure cook for 10mins. 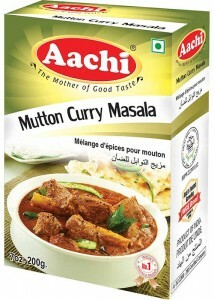 Now hot & spicy Aachi Meat is ready. 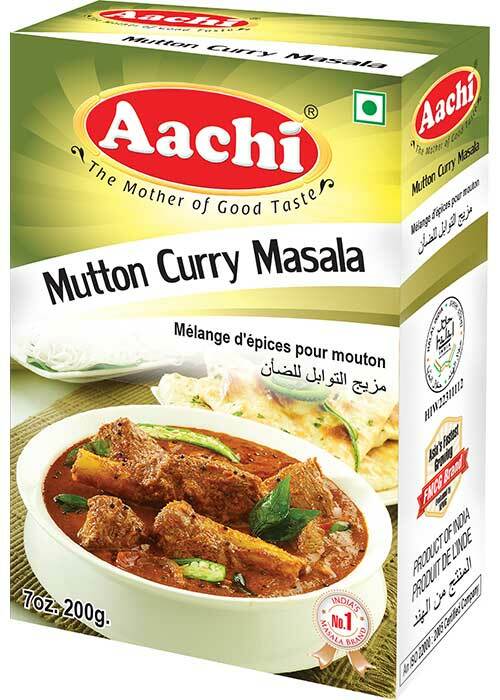 Coriander, Chilli, Cumin, Black Pepper, Cassia, Clove, Salt, Turmeric, Garlic, Cardamom, Fennel, Mint Leaf, Fenugreek, Star anise, Mustard, Dry Ginger and Bengal Gram.